One of the best quality Sumi brush. SuDao- "Dao of Calligraphy":the law of calligraphy. One of the best brushes for grand calligraphy and painting. Superior quality sheep hair. 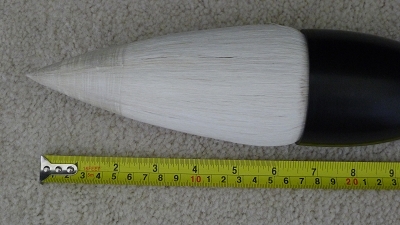 Handle: 19'' long; Bristle is 6'' in length and 2'' in dia. * Beautiful horn handle which will stimulate full inspiration leading you to dance with beauty on paper.